Pope Francis gave the first-ever papal address to Congress Thursday morning, during a special joint session of both chambers. The speech lasted around an hour and focused on key topics affecting the entire world in which the U.S. has a major role to play. Only lightly touching on abortion, the pope spent a great deal of time talking about the death penalty, climate change and immigration, as well as the refugee crisis in Europe. Immigration has been a highly contentious subject as the presidential race continues to heat up; a fact that Pope Francis is surely aware of. While there were several issues the pope took time to highlight, his thoughts on immigration and refugee policies were the big takeaways from his speech to Congress. Our world is facing a refugee crisis of a magnitude not seen since the Second World War. This presents us with great challenges and many hard decisions. On this continent, too, thousands of persons are led to travel north in search of a better life for themselves and for their loved ones, in search of greater opportunities. Is this not what we want for our own children? We must not be taken aback by their numbers, but rather view them as persons, seeing their faces and listening to their stories, trying to respond as best we can to their situation. Here, Pope Francis called attention to the idea that Congress ought to think of the human element when matters of immigration are at hand. 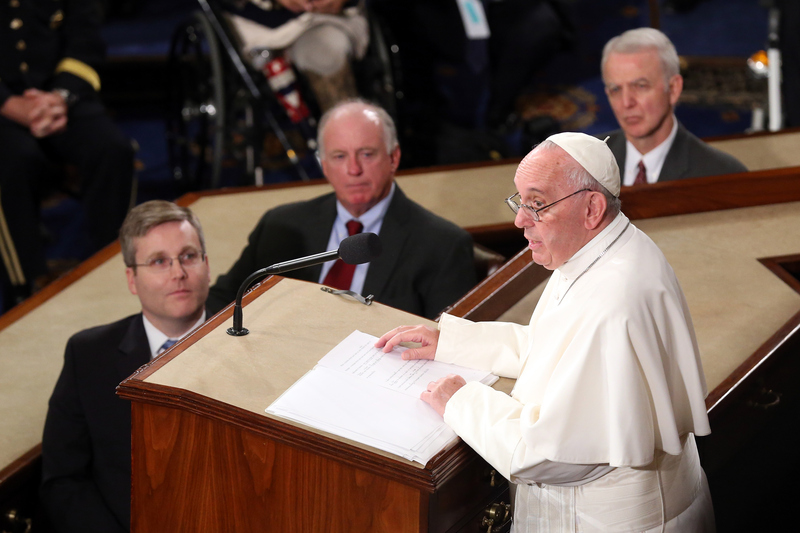 Directly addressing the matter of Mexican immigrants who come to the U.S., the pope urged Congress not to think about numbers, but rather about who these people are, what their needs are, and how the U.S. can help them meet their needs. When handling immigration, the Pope said we are to "respond in a way which is always humane, just and fraternal." Of course, all of this stands in stark contrast to the rhetoric around immigration that's coming out of the GOP; particularly from the frontrunner candidate for the Republican nomination, Donald Trump. In both of the Republican debates so far, immigration has been a topic of hot discussion, with Trump and others seeming hellbent on dramatically altering citizenship policies so that the U.S. would allow for as few immigrants as possible, especially from Mexico. It will be interesting to see if the pope's comments will be posed to the candidates in later debates (several of the presidential candidates are Catholic, and surely there are many who want to hear their responses).